There are two options to recover your password, we will describe both options, here in the article. 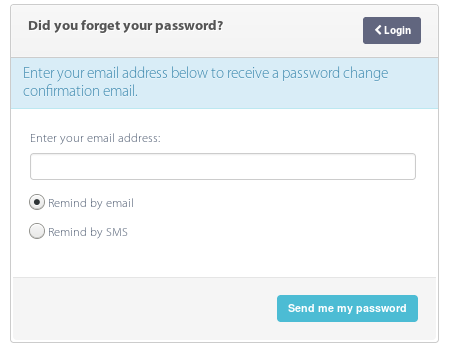 Enter you email address, which you are using in our system and press “Send me my password“. Once this is done, you will get confirmation email and will have to press the button “Reset Password” in the message content. After confirmation, you will get second email from our system with the new password. Once you initiate this, SMS with the new password will be sent to your phone instantly. Note. If you can not get the SMS, you can contact us by live chat or ticket system so that we could check if you have entered correct phone number.